Various authors - Pablo Picasso. Galerie Louise Leiris Publisher, Paris. 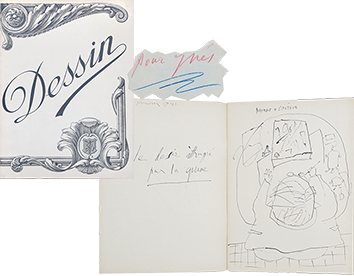 Catalogs, bound, (16,5 x 16,5 cm), wrappers illustrated on the front with an original lithograph in colours by Picasso for the first, and lithographs after Picasso for the two others, printed spines. Three catalogs of the Pablo Picasso exhibitions at Galerie Louise Leiris, profusely illustrated with plates in black and white and in colours. 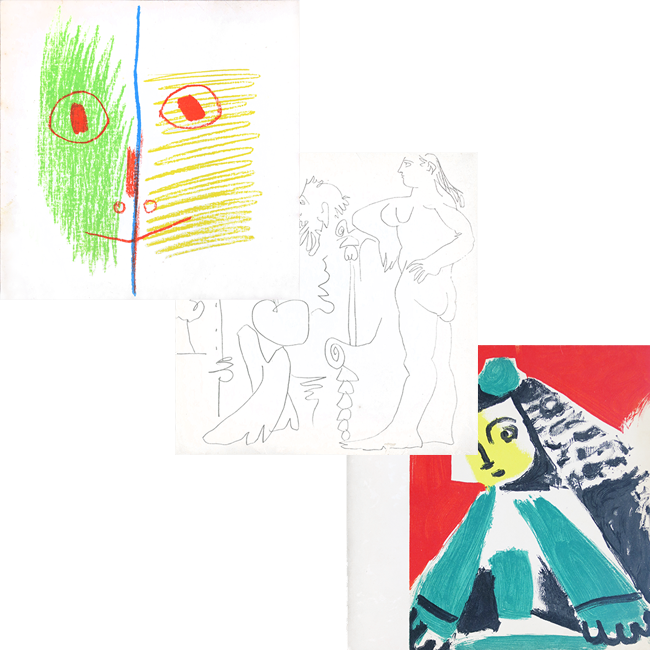 1) "Peintures 1955-1956", wrappers illustrated with an original lithograph in colours by Pablo Picasso, text by Daniel-Henri Kahnweiler ; 2) "Les Ménines", wrappers illustrated with a coloured lithograph after Picasso, text by Michel Leiris ; 3) "Peintures (Vauvenargues 1959-1960)", wrappers illustrated with a lithograph in black after Picasso, text by Maurice Jardot. Printed by Draeger and Atelier Mourlot for the wrappers, in Paris. Edition : circa 4000 copies. Condition : spines slightly toned, skinnings on volume 2 and 3, back of wrappers with soilings and dusty, otherwise good condition.